FROM THE TEAM AT BIOLYTIX! A new year always brings about fresh ideas for business and personal/family life. The Biolytix team thought that we would kick off the new year with a new website, so welcome. Keep an eye out for our updates here and on our Biolytix Facebook page. You will be able to keep up to date with what we are up to, what we are doing in the not too distant future, some helpful tips for keeping your home environmentally friendly, as well as environmental topics from around the world. As well as a new look and feel for our website our latest news is that we have just been granted a StandardsMark Licence from SAI Global confirming that the BioPod is manufactured to meet the requirements of the Australia New Zealand Standard 1546.3:2008. 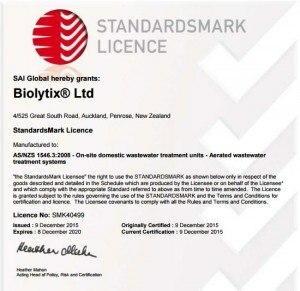 We believe we are one of the only wastewater treatment plant manufacturers in New Zealand to achieve this StandardsMark. A great Christmas present for all of us that were involved in achieving this and very reassuring to our installers and customers that we place such a high importance on quality assurance!